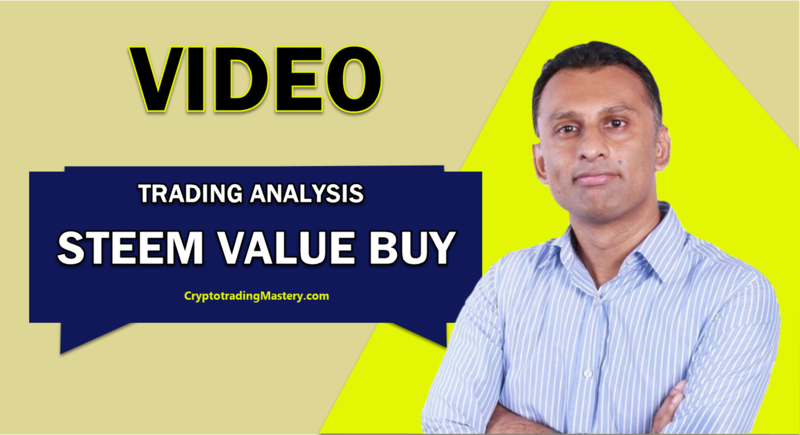 In todays analysis, we will be looking at STEEM. At the time of this writing its current price is $1.85. Having researched Steem, I am convinced, as an investment, this coin is a good buy and I like its business model. So from a fundamental perspective I like Steem as an investment, but not at the current price of $1.85. So let's look and see what the STEEM price chart is doing. The price on the daily chart is going up and is above the cloud but it is meeting resistance here both on the 34EMA and the Kijun-Sen, and if we look at the momentum it is in a down trend so, for now, there's not enough power to push it up. Turning our attention to the one hour chart (video says 4 hour shoudl be one hour) we see price hitting resistance both on the top of the cloud and the Tenkan-Sen. We also have had a Tenkan-Sen/Kijun-Sen cross, indicating that we should be out of our long positions for now and be sitting flat. We can also see a flag patter with a pole has been formed. For now, it looks like Steem, like many of the other cryptocurrencies at present, is just treading water as they all wait for the 1st August segwit implementation D-Day. 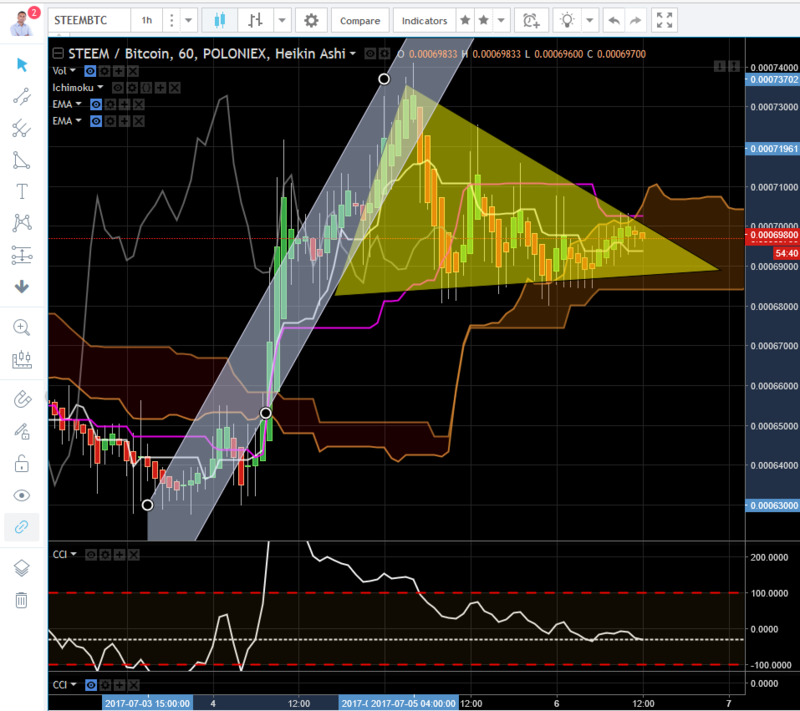 Now I'm actually expecting Steem to fall from its current price of $1.85 to its next level of significant support, which will reduce its listed price in half, expected to be in the region of $0.75cents to $$1.00. If it does, for me this is a great value long term buy. If you like this post feel free to "Resteem" this post to your followers, "VoteUp" and Follow me at "https://steemit.com/@supertrader". THANK YOU for resteeming that means alot to me and for your very kind words. I mainly started this as I saw so much dangerous advice given by "self proclaimed showman" inexperienced traders, but then I realised I have alot of information to share. I will be upfront I will be selling my courses in the future on my website to be launched soon but that's only if people are interested in pursing knowledge to make money by trading professionally with mental discipline and risk & money management. Once again, THANK YOU I really appreciate this. So you're saying you'd buy some if it goes below BTC 0.00025363 ? Thanks for the reply ! I'm also watching it, and the cloud from Ichimoku cloud was very interesting to discover because I looked it up on youtube and watched some explaination about it ! New videos coming out today! Don't worry, my website is launching soon and I wil be producing a whole range of courses - Ichimoku Clouds will be one of them and it will be an awesome course leaving you truely empowered as a trader. Wish I saw your video before buying steem! What do you think about skycoin, maidsafe and share which all attempt to reinvent the internet. And for good measure the other ones that try to do pieces of this: golem, sia, Storjx and filecoin (not sure about the last one - there is a new one coming out called something like that)? Yes not sure how many people followed this but Steemit call was spot on. Can pat myself on the back for that one. Hers my opinion on these coins I persoonally only want to trade coins with daily volume. Whilst I accept the new coins can rocket, there is a great deal of manipulation (Pump and dump) by people with money. Great if you oick it with them but can wipe your account out if you are facing the wrong way. I'd rather trade with more confidence than just taking a punt. Having said that you and other may have another opinion and not agree with my thoughts, and thats fair enough I accept that as at the end of the end everyone is trading with their own money.